Follow these rules for the proper disposal of paint thinner to keep your family and the planet safe from harm. Composed of mineral spirits, turpentine, and acetone or other solvents, paint thinner effectively does its job of thinning oil-based paints and cleaning tools like brushes and rollers. 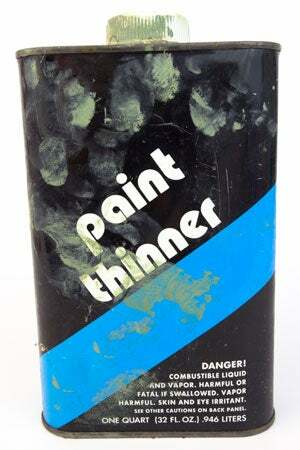 But if you aim to get rid of unused paint thinner once a project is complete, be sure to do so correctly. Tossing it in the trash is a serious fire hazard because paint thinner’s flash point—the temperature at which it can catch fire—is only 104 degrees Fahrenheit. Pouring it down the drain is also dangerous, as it can contaminate neighborhood groundwater. While laws, fines, and punishments—all of which vary by city and state—are in place to punish violators, proper disposal of paint thinner takes just a few precautionary measures. These steps for how to dispose of paint thinner should keep you, your neighborhood, and the planet safe. STEP 1: Strain, seal, and save used paint thinner for reuse. 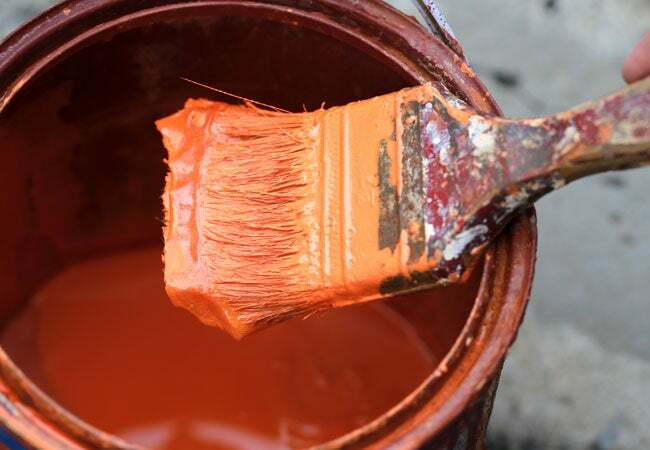 Pour the used paint thinner into a glass container (marked with the type of paint thinner and the date), seal it, and let any paint left behind from cleaning paintbrushes and rollers settle to the bottom. Store it away from heat, spark, and flame during this time. Then, the clear solvent is perfectly usable for cleaning applicators after future projects; slowly pour just the clean thinner into a new container and proceed to Step 2 for disposing of t he first container. Of course, it can take weeks or even months for the paint to settle, so you may want to strain the gunk from the good stuff to eliminate that wait time. To do so, put on rubber or nitrile gloves and, working in a well-ventilated space, pour the thinner through a few coffee filters into a glass jar large enough to hold all the liquid. The filters will collect the globs of paint and leave you with clean thinner. Let the coffee filters and paint globs dry out completely, then wrap them in newspaper and seal them in a plastic bag before placing them in the trash. As for the remaining thinner, seal the jar tight and label it for future use, then store it carefully away from children and pets. STEP 2: Toss emptied containers out with household trash. • If the dried sludge at the bottom is thicker, dispose of it at a hazardous waste collection facility or event (see Step 3). • If the sludge remains liquid-y, you can dry out the container of paint sludge by removing its lid and setting it outside to dry. Alternatively, don’t bother with drying out the solvent and dispose of paint thinner according to instructions in Step 3. STEP 3: Leftover paint thinner at a hazardous waste facility. Find your local hazardous waste collection facility with an online search for “hazardous waste collection” along with the name of your city, and a list of local disposal centers should pop up. The US Environmental Agency even contains a database of links to programs by state, where applicable. These places should accept completely sealed containers filled (or partially filled) with paint thinner. To be safe, though, read up on the local facility or program’s instructions so that you handle the disposal of paint thinner according to its terms. STEP 4: Remember that household or shop rags soaked with paint thinner must also be disposed of properly at a hazardous waste facility. • Fill a watertight metal container (like an empty, clean paint can) with rags and water to prevent any possible combustion. Tap its edges with a hammer to seal it tight and bring to the hazardous waste facility. • Alternately, you can let the rags dry flat in a well-ventilated space where there’s no wind to carry them away, then seal them in the fireproof pouch container (available online or at a hardware store). Then take the refuse to the hazardous waste center along with your remaining thinner.